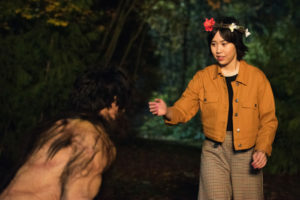 Legends of Tomorrow picks up where its puppet-wielding midseason finale left off, and “Lucha De Apuestas” dove straight into the Mona (Ramona Young) and Kaupe action without taking a breath. It also didn’t waste time when it came to opening Nate’s (Nick Zano) eyes as to who his father really was, though it may take Ava (Jes Macallan) much longer to accept in the wake of her latest tiff with Sara (Caity Lotz). Sometimes Beauty’s love can’t save the Beast. 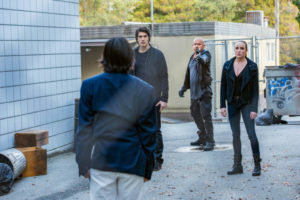 The episode didn’t have much at all to do with the “Lucha De Apuestas” of the title, which merely served as a hiding place for Konane while Mona tried to explain the truth of previous events to the Legends of Tomorrow before the Time Bureau tracked her and her Kaupe boyfriend down. Using poor Gary’s memory gadget against him, she sent Konane to Mexico City in 1961, where he became a beloved Lucha Libre fighter by the name of El Lobo. Sara first plotted to use Mona’s trust against her and take them both in, but doing so led to an anti-censorship revolt against the Mexican government (sure it did). So instead she was wise enough to give the girl a chance to explain herself and was rewarded with an even bigger conspiracy at work. But while she and her team did good work, her relationship suffered in the process. See, Ava was none too keen on her girlfriend going behind her back (if one must call it that) and doing her job as a Legend at the expense of Ava’s job as director of the Time Bureau. Even when Sara looped her in on the situation and provided evidence that Hank was up to no good and Mona was innocent, Ava not only remained insistent that this was about Sara putting her job above Ava – she also claimed that there was nothing wrong with Hank experimenting on magical creatures. Granted, the Legends of Tomorrow themselves started off being just fine with sending magical creatures to Hell. But we all agreed that was wrong, and thanks to Charlie’s (Maisie Richardson-Sellers) interference, they learned their lesson. I thought Ava had too, but apparently now she’s angry that her girlfriend would rather save the lives of those people who aren’t even human than save the money Hank has invested in the Time Bureau. Ray was also in this episode, for the record. The argument was frankly ludicrous, and “Lucha De Apuestas” made Ava seem uncharacteristically amoral for the sake of a fight that the couple did not need. If they wanted to make this about Sara spending more time on the Waverider than with her girlfriend, there were plenty of ways to do it without making Ava respond “Who cares?” to accusations of magical creature cruelty. It was especially jarring when followed by one of Hank’s men literally killing Konane before Mona’s eyes, and her transformation afterwards meant that she would now be someone Ava considered beneath her. All of this was juxtaposed against Nate’s realistic and gut-wrenching reaction to realizing his father was behind the torture of Konane, after which he immediately enacted a plan to investigate and stop him, so at least someone was acting like a rational human being. But not everything about the Nate side of things was a master class in character development. It seems the Legends of Tomorrow writers felt that Nate was ready for a post-Amaya romance, and “Lucha De Apuestas” started dropping hints that Zari (Tala Ashe) was up to bat next. For example, in order to grab Hank’s phone and let Zari hack her way into it, Nate had to introduce her as his girlfriend to his parents. Not only were we forced to witness her sad(?) face when he commented that actually dating would make no sense, we also had to hear his mom comment on her child-bearing hips. Never again, please! Nevertheless, the two worked well together and it was nice to see Zari’s skillset actually become part of the plot for once. While “Lucha De Apuestas” wasn’t the show’s best outing by far, it still contained some classic moments. Avalance’s Argentine Tango was excellently choreographed even if the content was frustrating, Mona being a fan of Mick’s (Dominic Purcell) series was adorable, and Constantine (Matt Ryan) smoking while a full-scale fight broke out around him was perfectly in character. Sometimes that’s all it takes, and this series is usually so consistent that one off week can be forgiven.